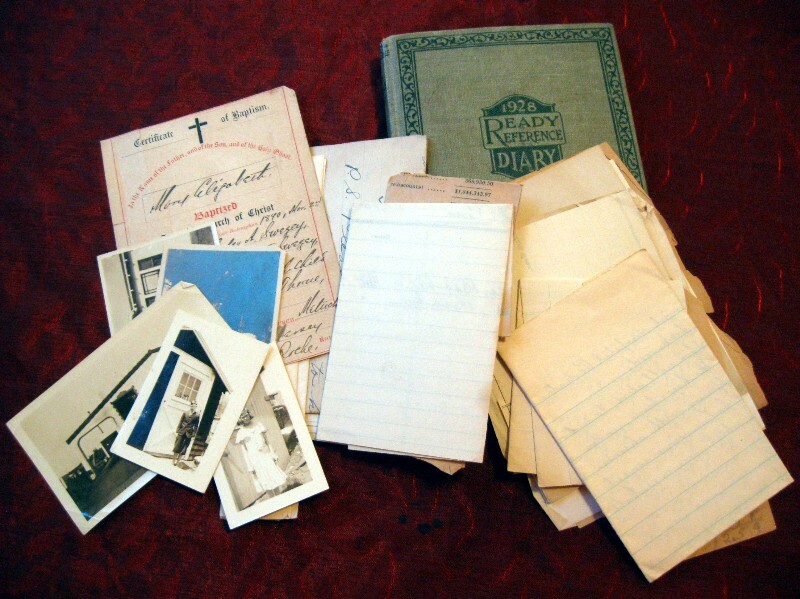 People often are shocked to discover personal things like old photos, diaries, scrapbooks, and letters up for sale at auctions and estate sales, like this collection (shown at left, sold by kathct). Many people, like myself, like to adopt such ephemera, and as we carry it home in our hands we wonder just how these things were available for sale… And weren’t we lucky to be the one to rescue and adopt them! we hope to see you soon I am keeping my fingers crossed for I pulled a piece of my toe nail off and I sure have a sore toe, think there is a little infection there but am doctoring it and hoping it will be O.K. For some reason, such a short note all about a toe is amusing to me. 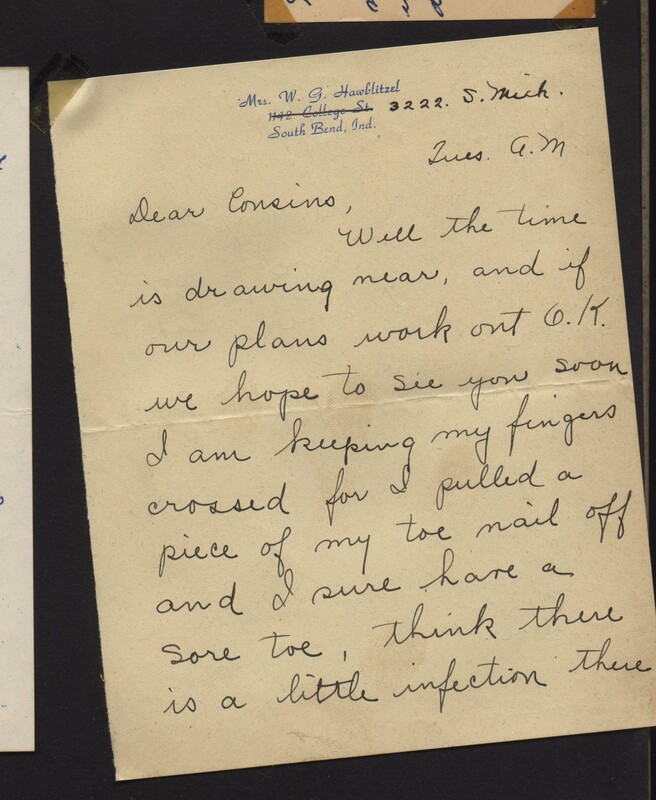 It’s not just a “I hurt my toe,” but a rather detailed account of injury in such a short bit of correspondence yet. And years later I feel I must be in the same boat as Henrietta’s cousins — left wondering just how she managed to pull off a piece of toenail! We collectors like vintage letters which make us feel like we know the sender — or make us want to! But the most popular letters are sets of letters over a period of time. As correspondence, there are typically two sets of letters; each a side of the conversation, collected by the recipient. It’s quite rare to have both sets of letters, like this collection of 115 letters between a father and daughter between 1911 and 1934 (photo below; sold by bdbrowncollect), but just one set or side of the conversation can tell you quite a story. That story may be regarding a situation, such as life during WWII or a courtship; or the story may be more intimately revealing of an individual person’s character, like a diary. In either case, such old letters are fascinating — and not just for the vicarious among us. Writers love to get their hands on such letters (and old diaries) as they inspire characters in novels, plots for films, etc. I recall just a few years ago when there was a special set of letters listed on eBay that went for nearly $300 dollars. (While we don’t like to dwell on the monetary values of things here at Inherited Values, I am compelled to mention it, in context; to illustrate the desire to own creating demand, affecting price.) Three hundred dollars is a pretty pricey sum for approximately two dozen letters; but these were no ordinary letters. This set of letters, written in the 1930s was saved by a woman who had an affair while she was married — and there were letters from both her traveling salesmen suitor and her eventually heartbroken and disgruntled husband. Though the seller had read all the letters, every ultimatum, every plea, the letters contained no final outcome of this vintage lover’s triangle. But not everyone gets rid of their family’s old letters. I now know that my grandmother at 60 taught 6th grade, bought commercial real estate, took in boarders, thought flying saucers were a mode of transportation, worried about getting sued because of an ill-tempered Pekinese, and commented on every murder and suicide when she wrote to my mother who was a 20 year old student at UC Berkeley. I’ve been obsessing over these odd letters, and I think I know where in the familial gene pool that tendency might have come from.